In Ayurveda, fruits are considered one of the purest foods that enhance ojas ( vitality, immunity and strength). They are chocked full of nutrients and vitamins and antioxidant properties. 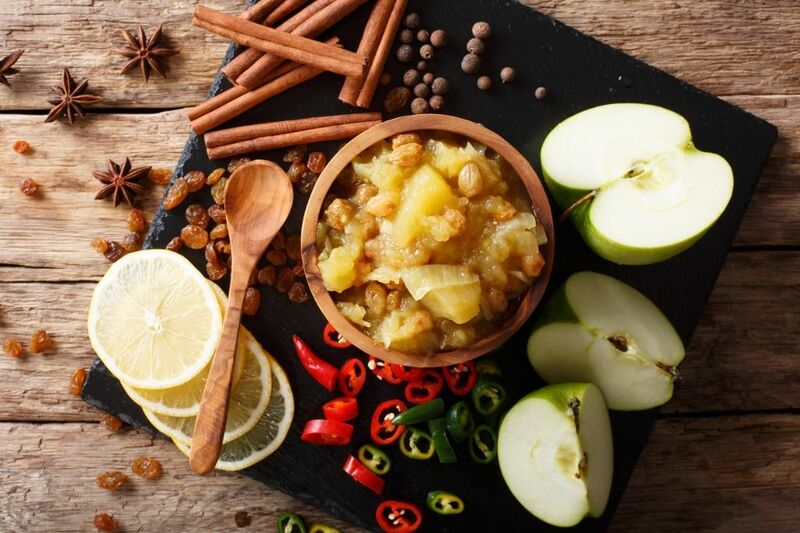 There are different types of chutneys incorporating the six tastes and using many different types of fruits and spices. When used correctly, chutneys can aid in digestion, kindle agni and promote health. Typically, chutneys are rather easy to prepare. In general, the fruits and spices are blended together and served. In some cases, the spices are roasted first and then added to the blender. The three chutney recipes below are from Heaven’s Banquet by Miriam Kasin Hospodar. A teaspoon or two of this sweet, tart chutney can help stoke the fires of your agni (digestive fire) and make your meal more delicious. This recipe contains five of the six Ayurvedic tastes and is also rich in nutrients like Vitamin C—a natural antioxidant that boosts immunity. According to Ayurveda, fruits promote ojas, the finest by-product of digestion. Place all ingredients on a pot and bring to a boil. Reduce heat and then simmer for about 30 minutes, stirring occasionally. Serve. Enjoy! This is a simple recipe using the remarkable coriander leaf (cilantro). It is not only delicious, but it is a safe way to begin purifying deep toxins (known as garavisha) from the body. You can eat cilantro chutney with holy basil (tulsi) as an addition to your diet. The cilantro is said to help remove heavy metals, and the holy basil is helpful in eliminating two particular kinds of toxins recognized by ayurveda — amavisha and garavisha. If you grow it in your home, it helps purify the air as well. It grows easily in most spring-summer north American climates. Mix all ingredients and blend together to a thin paste. Add salt to taste. You can use this chutney with cooked veggies, rice and other grains and flatbreads (chapatis). Add the remaining ingredients. Cover and simmer for 10 minutes. Purée in the blender or food processor until smooth.